Client: the end users will have access to the AppTester interface via a web browser. Web server: ideally a web server is in place to route traffic between the client and the application. In a clustered environment this web server also provides load balancing functionality. 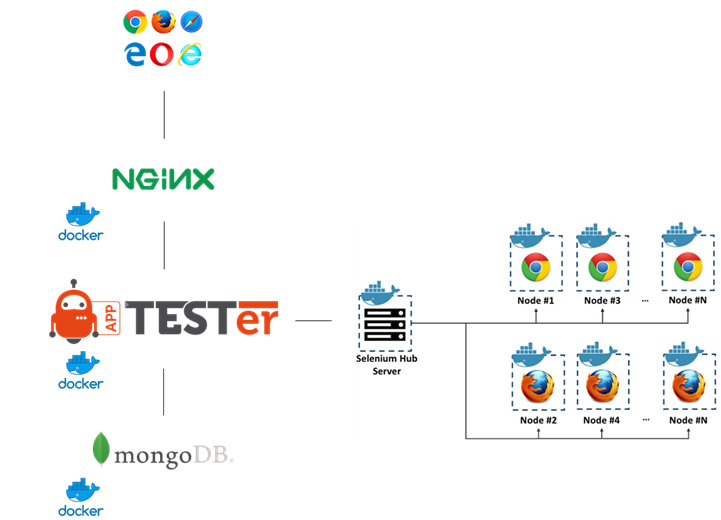 Application layer: an AppTester container that contains the main application logic for defining and executing test cases. This container is linked to a Selenium Hub container and subsequent Selenium worker nodes for UI test case execution. Database layer: a MongoDB NoSQL database is used for data storage. This is where the test case definitions and results will be stored. The AppTester Docker image will be provided to you by You-Get and will allow you to setup your own AppTester environment.